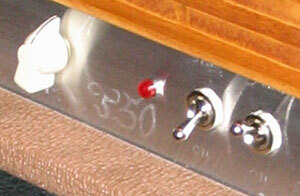 The hawk is a fixed bias, 2*34, solid state rectified amp with 3 12ax7 "preamp" tubes. It's designed to be touch sensitive, mean and lean but still have a Marshall style midrange and bass chunk without flubbyness. Mine is the first el34 Hawk produced, it started with the Thunderbird design and has the same control layout, Volume, T.C (Tweak Control) and cut. The T.C. has impact on gain and also on the tone structure. The cut is a cross between a traditional (Vox) cut control and a tone control, turned clockwise there is more treble counter clockwise reduces treble and have some effect on other frequencies as well. I have no idea how T.C. and Cut works from a technical point of view. From a player point of view the controls are great, it allows you to fine tune the response and tonal character so that it suits different guitars perfectly. The amp also has a built in attenuator, great for gigging in small clubs. Sometimes I prefer to attenuate the amp somewhat since I can get more power amp compression that way. The amp delivers amazing clean that can morph in to early Van Halen style rhythm and lead sounds. The amp has features that reminds me of Trainwreck express and Komet, you can control the amp very much from you're guitar by using touch, volume and tone controls and pickup selection. With a strat style neck pickup you can get very SRV'ish tones but when you switch to bridge but even a tele bridge pickup will still sound fat and chewey at the exact same setting. If I ease the volume back slightly on the Tele I go from rock lead to country twang. With humbuckers this amp has a lot of gain, more than a Plexi and it's great for that early Van Halen type of sound. Even with a lot of gain the tone is articulate and the response is fast and firm. The attack from this amp can kill small animals and low flying birds with it direct attack, yet the amps is not earsplitting, the tone is balanced and sweet a lot of top end but never ice picky. I have mainly used Fuzz, treble boost and a Hot Cake in front of the amp and it takes pedals very well, even if I seldom need pedals. I played a whole gig with Beatles songs, SRV blues, Hillbilly Country, AC/DC and Stones covers and some harder rocking number (you really got me for example) and a Tele style guitar and I just used the Hot Cake for one song and that's just because I almost stumbled on it. Otherwise I managed to go from SRV to Pete Anderson to Angus tones by just adjusting playing style and using guitars tone, volume and pickups. Since my amp is the first ever built it has a simpler cabinet and no fancy wood panel and the Hawk name is not engraved anywhere, instead it say T50 on the front panel since Tommy initially designed it as a 50w Thunderbird. But during the build process a gain stage was added and the T.C and Tone controls changed to better fit the new design. In all it's a versatile Rock'n'Roll amp that is more flexible than the simple layout suggest. It delivers tones that combines old school Plexi sounds with a Trainwreck feel and some unique Tommy Cougar magic. The Cougar tone is most evident in the clear and articulate high end that gives an almost SRV style sound and also keeps the amp percussive and response with loads of gain. 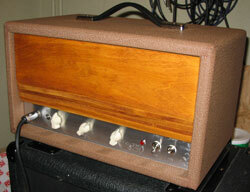 It is also an amp that sounds "right" the first time you hear it while still having a distinct tone of it's own. It feels good to say that one of the best amps in world is built here in Sweden. Check out the Hawk at www.custombycougar.com and click here for some samples.